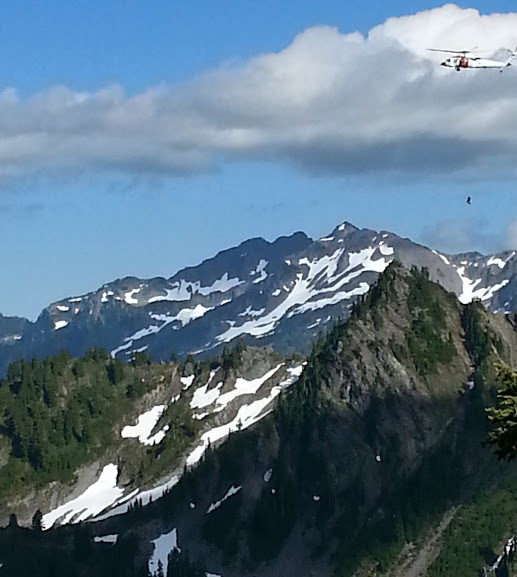 The ground rescue that took place for the next few hours was out of my sight, behind me just off the main ridgeline. It was not until I talked to one of my rescuers a few weeks later that I learned their side of the story. Come to find out the rock was too rotten for the rescue team to get their climbing rope safely anchored. The rescuers would have to rappel down from the main summit to reach me. The issue was getting there safely, because of the bad gullies and crumbly rock. Looking back, I am glad that no one got hurt attempting my rescue. Some time had passed, then I got my first visual of a member of the climbing team. He had repelled off the main ridgeline and was looking at the gully system that separated me from my rescue. These were very steep and impassible even with ropes. More time had passed and I answered another yelling voice. Wanted to know how I was holding up and how I was doing for water. Later in the conversation I found out there was a new plan. 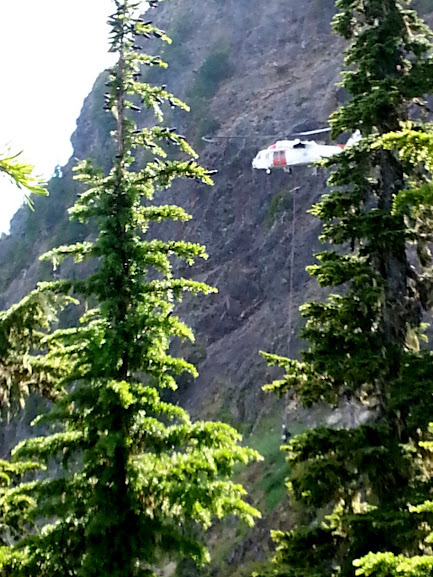 I would sit tight, because Navy Rescue would be flying in to assist getting off the cliff band. They were roughly two hours out. This gave me more time to reflect over the situation. Out of respect for the rescue effort, this is the only photo I took of the whole operation. This is Navy Rescue flying over me to assess the situation. Just like the Parks little helicopter, it flew over me for some time to get a birds eye view and plan of rescue. They flew over the area for quite some time before making their final approach. At the time I thought they were having issues with the afternoon wind that had came up. I began to mentally prepare myself to stay the night on the ledge. Come to find out, the Black Hawk had too much fuel to attempt the rescue. They were just maneuvering around to lighten their load. Once their fuel was burnt, they opened the doors on the Black Hawk and began to lower their elevation. 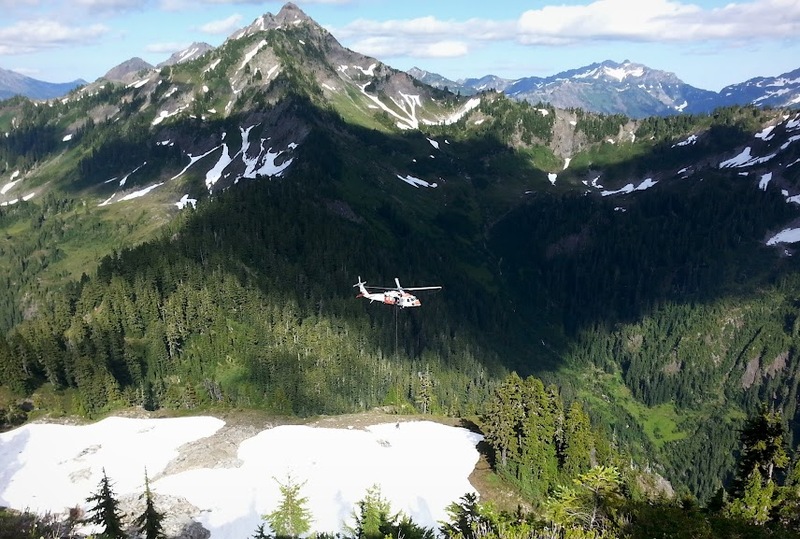 I instantly started to feel the wash from helicopter, even more concerning was all the loose scree and rocks that were sitting on the summit block, now all came falling down at me, all at once. I instantly got low, holding onto one lone little shrub and dug my fingers of the other hand in a little mouse hole. Secondly, protected my head the best I could with my left forearm and backpack from all the falling objects. A softball size rock did bounce off my forearm and the rest were just scree, which stings, but not fatal. Later I found out that a Black Hawk Helo has a wash of 90 mph winds. That would explain the feeling of getting pushed off the ledge I was crouched. Not a basket, but a man repelled down to me with an extra harness. After a dosey doe to put on the harness, the last step was to attach the carabiner which connected me to him. The signal was given and up we went. Once in the air, the wind started to put both of us into a spin. Felt a huge sigh of relief once I was off that ledge and got my first look back down at the mess I got myself in. I shook my head and said a few curse words. Then we started to gain more elevation, which put us in a super fast spin. Felt like being on a merry go round from hell, but at least I was safe. 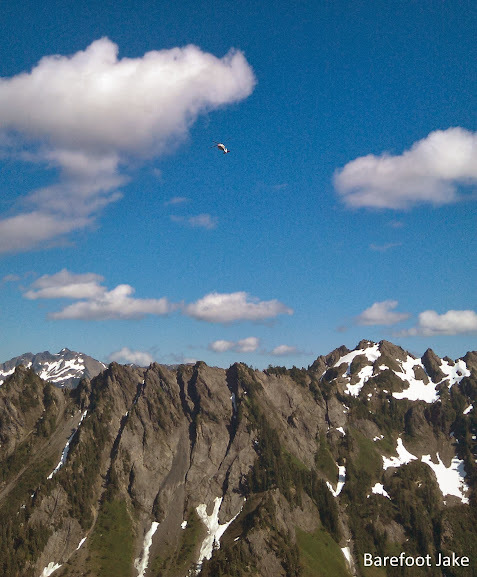 Shortly after we touched down on a snowfield, we got out of the way and then the Black Hawk landed. We both got in and flew to the Port Angeles airport. That ride over the Olympic Mountains was very emotional for me - flying over places I have already been this year, seeing them from the air for the first time. At the time I thought my hiking season was over, based on my swollen and scraped up foot that gave me pain. I hate doctors, so I refused two forms of medical attention after landing. Then I had a short meeting with my Rescuers. The wanted to know 'how the hell I got up there'. Once home I had half my family there waiting for me in tears and hysterics, because it was unclear if I was going to make it down the mountain. It was a very emotional and memorable few days. *most photos above donated by rescuers. Never keep moving forward to an area where you can't back out. Climbing to the summit of O'Neal Peak put me in a position where I could not turn around because of rotten rock. Always have a safe escape route incase forward progress is no longer an option. Always follow game when traveling off trail to attempt a traverse route. I was following prints the first few days, until climbing the summit block. If animals can't go there because of terrain - neither should I. Have the right maps. I now have a 7.5 minute detail topographical rule when traveling new routes off trail. The map I used did not have important land features, such as gullies or cliff bands. Never depend on electronics. Even though the disconnected cell phone saved me this time, I would never go into the woods and depend on that luck. Tower alignment and location of the call is the only reason it even had a chance in this Park - any other peak in the area would not have the same results. 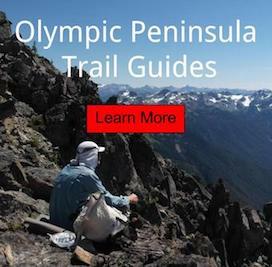 GPS devices often fail in the Olympic Mountains. I would only suggest a PLB for people looking for an emergency option. They need your help, to help us! Please consider supporting local groups, such as Olympic Mountain Rescue. What would you do? Ever thought about what would happen if you had to be rescued? Leave a comment below.